Your equipment is delicate. One drop and you could be out thousands of dollars or more. 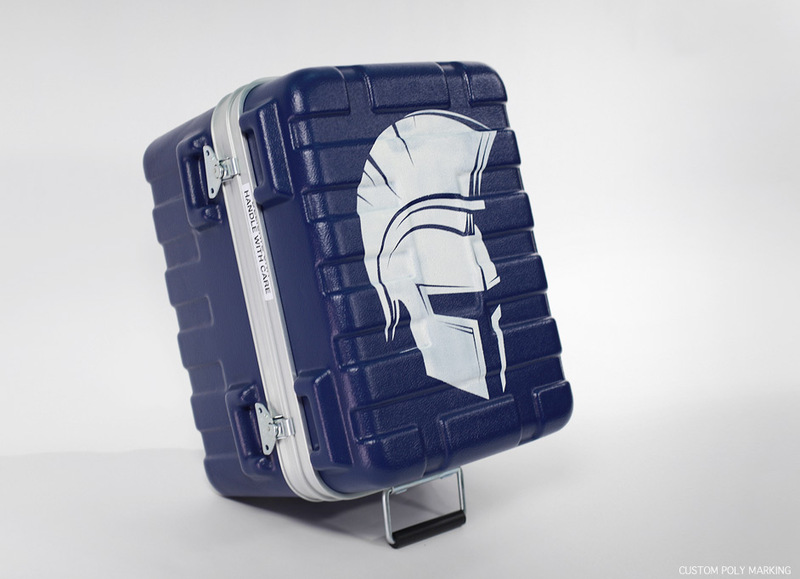 Protect your gear with a rugged, customized Thermodyne case. 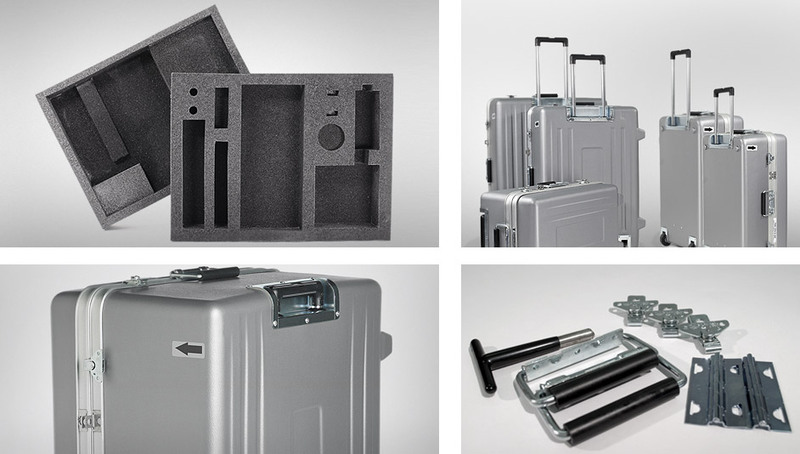 Available in every shape and size, Thermodyne shipping and carrying cases are manufactured with custom foam interiors to gently cradle your equipment on impact. Thermodyne interiors use multiple density materials to lend support where it's needed. All interiors are custom engineered, relying on decades of proven foam design to put the right protection in the right spot. It's a no-cost service Thermodyne offers to each and every single customer. internal shock-isolated cages, inner lids, electrical panels, waterproof connectors, specially tailored extrusions or modified plastic parts. Our top-notch team of engineers, machinists and fabricators can work their magic for you at minimal expense with little lead time. To top it off, we provide upfront, honest pricing before you place your order. No surprises, just industry leading custom work. If you need to match your company colors or just want to quickly identify your different gear without opening cases, we've got the solution for you. Thermodyne offers the industry's largest stock of in-house colors. Don't see the color you need? We also offer custom Pantone color matching if you have a specific color in mind. Custom colored shells, extrusions, hardware and trim can be ordered at minimal cost. Give us a call for more details. 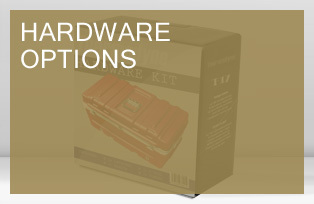 At Thermodyne, we offer thousands of hardware choices. From small key locks to large heavy-duty cargo lift rings. For the outside of the case Thermodyne offers custom plated hardware, customized hardware materials for different environmental extremes, custom sealed hook-up panels for internal electronics and more. 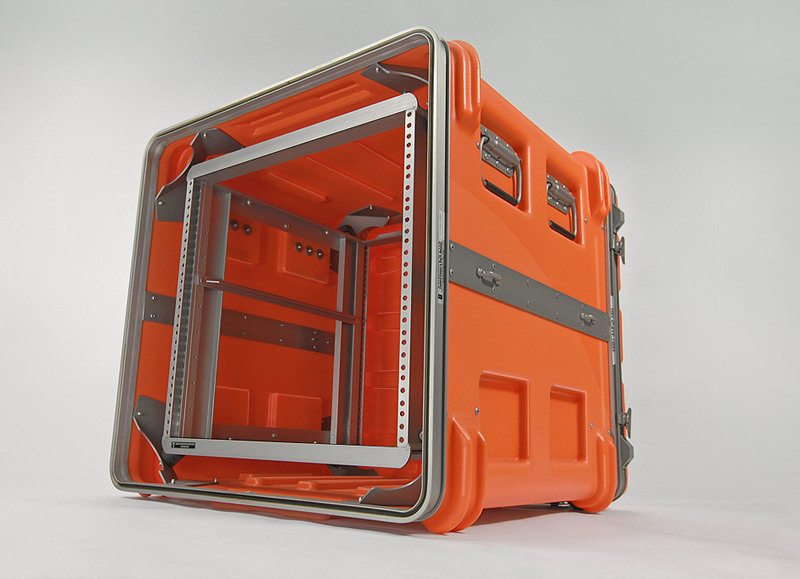 For the inside of the case we offer everything from small desiccant holders to large internal-mounted security cages. Customizing your hardware is easy and the combinations are almost limitless, call us now for more information. If you need direction or suggestions..we're here to help. With over 50 years of experience we know something about configuring customized shipping & carrying cases. At Thermodyne, our Engineers are never satisfied. 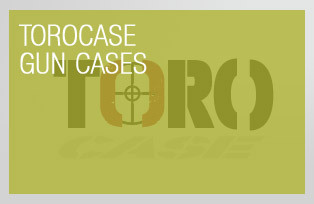 They've taken the legendary, proven Thermodyne cases and used them as a starting point. Improvements like military-grade, High Molecular Weight Polyethylene and shock-resilient hardened-grip handles have been integrated into each product model. 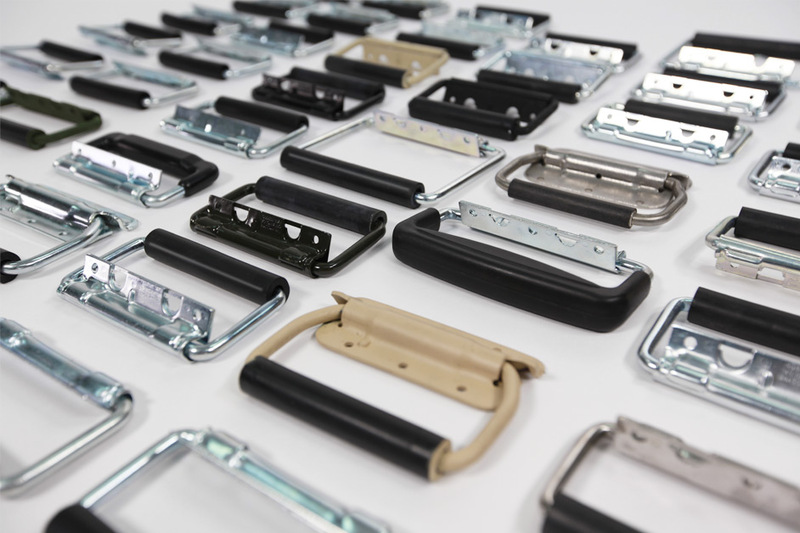 Hardware advances, like Thermodyne's patented spring-loaded latches and Power-Grip sealed extrusions have improved on an already industry-leading design. 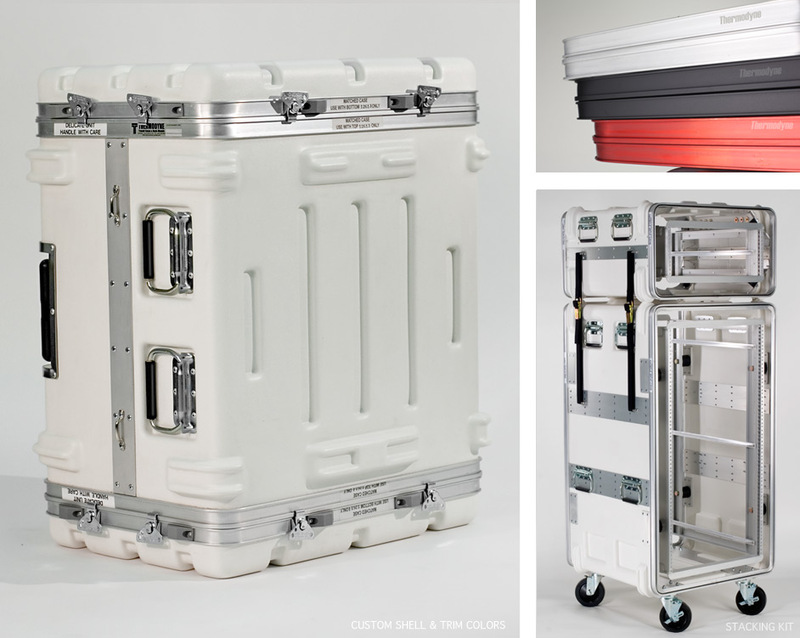 All customized Thermodyne cases are designed with the future in-mind. During your Thermodyne case's design phase, every last usable square inch is utilized. If your gear has an unusual shape, our Engineers can utilize any leftover space to include additional accessory cavities. If your gear ever changes over time, all Thermodyne cases can be re-foamed with a brand new factory custom foam insert. Give us a call for even more details on Thermodyne's custom foam sets. Did you know Thermodyne can customize the depth on most case models? The lid and base depth on our most popular sizes can be extended or reduced at little or no cost. 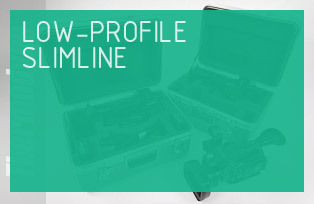 This allows your case to be customized without added lead time. Only Thermodyne offers this level of size customization without tooling charges. Just give us a call and we'll handle all the little details. With an inventory of over 50+ years of tooling and molds, Thermodyne offers the largest selection of molded cases sizes on earth. Over 600+ sizes, measuring from just a couple inches on-up to twenty-foot in length. By some chance, if you can't find the size you need we also offer new tooling fabrication and modification. All tooling is engineered, fabricated and tested in-house. Every step of the process is tightly controlled using ISO Quality methods. Small tooling can be custom machined and fabricated in as little as a week, while large casted tooling typically takes between 2 to 4 weeks. Call today to find out how we can help you solve your needs. Go ahead... make it yours! 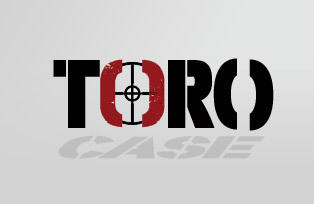 No matter if you just want to mark your custom case for quick identification or if you want to better integrate your Thermodyne case into your current company's product line. Make an impression. Place your company name or logo on your case today! 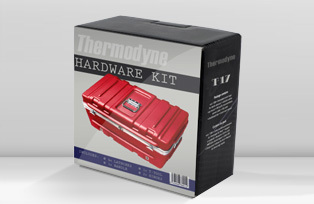 You'll be surprised at just how easy and affordable Thermodyne makes it. Customized Poly-Marking: With no minimum quantities, marking is available in single colors and provides a rugged, weathered aesthetic. Perfect for low numbered runs, from 1 to 5 pcs. This semi-permanent marking is ideal for quick identification of special equipment without having to open each individual case. It also provides a low-cost method of screening your logo. This process is limited to 1 to 5 piece case orders. When a clean, professional look is desired, Thermodyne's rugged weather-proof labels are ideal. Available in full continuous color, these labels are custom manufactured and applied in our factory for a lifetime of reliable adhesion. Manufacture to meet rugged MIL-SPEC. Thermodyne premium weather-proof labels are available for any size order and can be produced in as little as one to two weeks. Custom logo embossing is the ultimate in product branding. 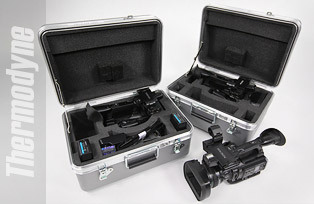 Get the look of a full production custom case without needing to own the production line. Thermodyne's permanent embossed logos give you the professional look your products deserve, at an affordable cost that won't break the bank. Surprisingly low minimum order requirements make this option great for any size company, large or small. Call us now for more details! Standard lead time on Poly-Marking is 24 hours, Custom Weatherproof Labels are 1 to 2 weeks, Embossing is approximately 2 Weeks. Call to learn more about custom logos! © 2014 Thermodyne. All Rights Reserved.